A still from Newton is now a viral meme. Rajkummar Rao's Newton was selected as India's official entry to the prestigious Academy Awards or the Oscars. The movie opened last week to good reviews. However, there is something else from the movie that has Twitter fawning over it. More specifically, it is a still from the dark comedy that has become a hilarious and viral meme on Twitter. The scene, which was also a part of the movie trailer, shows Pankaj Tripathi challenging Rajkummar Rao by saying nobody would turn up at the polling booth. "Main likh ke deta hun, koi nahi aayega (I will give it to you in writing, nobody will show up)" he says. Friend : Let's plan a Goa trip with our school buddies. This is not the only scene from the movie Newton that has turned into a meme. 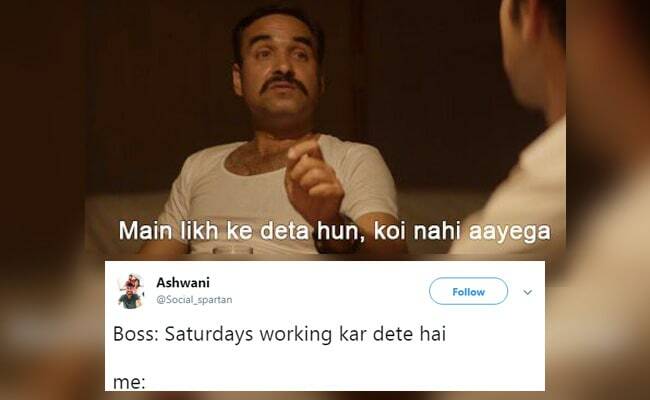 Rajkummar Rao aka Newton's reply is in itself a meme too! You can read the Newton review here.